There's a common thread between all the number #1 country hits Allen Shamblin has written or co-written. From Randy Travis's "He Walked on Water" to Mike Reid's "Walk on Faith," from Collin Raye's "In This Life" to Toby Keith's "We Were in Love," each song boasts a storyline as memorable as its melody. Why is Shamblin so strongly drawn to story songs? "Maybe," he ventures, "it's because I was born in East Tennessee, and the oral tradition is strong in that part of the country. Later, I moved to Texas where there's also a strong story-telling tradition. very early on I began to fall in love with the idea that someone could tell a story, and I could visualize it in my mind." I wanted an organic vibe, as if I were coming into your living room and playing you a song I'd just written. In 1987, Shamblin moved to Nashville, where he parked cars and worked in a warehouse while circuLating his demo tape. Luckily, his name opened doors - Allen is a distant cousin of legendary Western swing guitarist Eldon Shamblin. ("I never met him," says Allen, "but when he passed on, I held his picture up to my grandfather's, and they could have been brothers.") But ultimately it was Allen's songs, not his surname, that inspired so many artists and songwriters to seek him out as a writing partner. Assemble any group of Nashville songsmiths, and one guaranteed topic of conversation is whether it's wiser to create fully fleshed-out demos or present songs with bare-bones instrumental backing. Where does Shamblin side in the debate? "I've done everything from full-blown demos to stripped-down guitar/vocal and piano/vocal ones," he replies. "But I've got to say, I've had the majority of my success from the simplest demos. "I Can't Make You Love Me," which Bonnie Raitt recorded, was just a piano/vocal demo, as was "In This Life." And the "He Walked on Water" demo was just me and my Yamaha guitar." Shamblin is sticking with that less-is-more philosophy as he prepares his first solo album of story songs. "So far," he says, "everything we've recorded has been performed live. I wanted an organic vibe, as if I were coming into your living room and playing you a song I'd just written. I'm trying to celebrate my faults, if you will. Not magnify them, but not reduce them either." 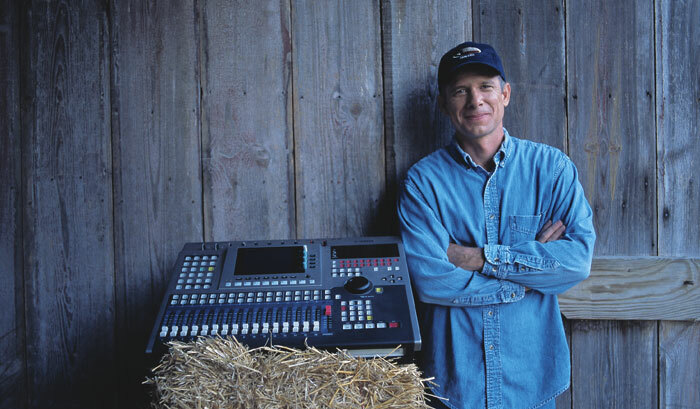 A Yamaha AW4416 digital audio workstation has been a crucial part of Shamblin's keep-it-simple strategy. "It's so straightforward, just perfect for what I'm doing," he says. "For me, equipment has to remain in the realm of being a tool, not some hole you fall into. I'm not real technical - in fact, the only thing I'd ever worked on before getting the Yamaha was a little boom box. But as soon as I discovered the Yamaha's 'Quick Record' button, I was off and running. We'd just fire up the tracks we were using and press 'record'. And the technical quality is excellent for my intent: an honest sound without a lot of effects. I was blown away when we did the very first song. I thought, 'Wow, this is it!'" According to Shamblin, that first session set the tone for the entire project: "The track was 'Rich Man's Battle,' a story song about the Civil War. I wanted the ambience of a soldier sitting around the fire at the end of the day, so we set up a mic on the back porch of our farmhouse. There was a mockingbird singing in a tree, and this bird sang the most unbelievable things, right on key. People ask me if we dragged and dropped those sounds in, but no - that's what he actually sang." Shamblin sees the disc as a concept album of sorts. "It's a collage of interrelated stories from throughout my life, all of them true," he says. "The theme of family is very strong throughout - parents, grandparents, brothers, and sisters pop up everywhere. Places are prominent too, and for some reason, so are dogs.